A step-by-step photoshoot prep and business guide. Make more money, establish your value, and create raving fans. Successfully plan out your upcoming portrait photo shoot. Run your photography business in a sustainable way. Avoid burnout in the long run. Learn how to protect yourself with a contract. Successfully handle your client after the shoot. It would be helpful if you already knew the basics of how a digital camera works. "A top quality course with good advice from a pro...I really enjoy digging in the workflow of a pro that's well done (good sound, great video). Top quality in the narrative tone and facts. So, big thank you. And of course, I want more 8-)"
Have a photoshoot coming up? Turn your clients into fans with less stress. Learn how to establish and maintain your value, even when first starting out. Run your business in a sustainable way. Avoid frustration, discouragement, and burnout. Don't make common "newbie" mistakes. The preparation required before a photo shoot is just as important as the photo shoot itself, and the actions you take after a photo shoot carry equal weight, if not more, than the actions you took before the shoot. This course will walk you through the process of planning for your first paid portrait session, all the way to the post-shoot stage, when you're gathering important client testimonials and sharing on social media. Whether it be for a friend, family member, or complete stranger, there are basic steps you absolutely need to take in order to ensure that you are prepared for your shoot. Crush your first photo shoot without the common mistakes so many newbies make, and make more money in your photography business in the long run. This course will be especially useful to you if you're still relatively new to the game of getting paid for your talent, or even if you want to pick up a few tips. ***While a tip or two is mentioned here or there, we will NOT be covering the technical aspects of photography, like aperture, shutterspeed, ISO, etc. I really want to keep the course focused on the Best Practices of Running your photography business, which is largely overlooked by new photographers. Ready to bring your photography business to the next level? Enroll now and let's get started! This course is best suited for newbie photographers who have their first portrait photo shoot coming up, or who want to refine their business process. + – Is This The Course For You? This course will walk you through the process of planning for your first paid portrait session, all the way to the post-shoot stage, when you’re gathering important client testimonials and referrals. This course will help you crush your first photo shoot without the common mistakes so many newbies make, and will ultimately help you to make more money in your photography business in the long run. It’s key that you find out what your client’s expectations are (as opposed to just assuming them, which can land you in big trouble). This can include what kind of shots they want, and what style they want them in. One thing I like to have them do is pinpoint specific examples they like not just from my portfolio, and also from the web at large so that I can see what they’re referring to. Push them to articulate the exact style they gravitate towards, and have them follow up by sending you some links to photos they like via email. In this lesson, we discuss the importance of doing your research before the shoot so that you walk into it with tons of inspiration! Never walk into a photo shoot lacking ideas. One of the most difficult aspects of business for budding photographers (and creatives in general) is having the money conversation with clients. In this lesson we cover the importance of having that conversation, and how cheap clients are not necessarily your best clients. What do you do if a family or friend approaches you asking for a freebie? We cover that tricky situation as well. In this lesson, it's vital that you always have some form of a contract that you have your client sign. It protects both parties. In this video, I will show you the contract I use as we discuss the most important elements that you will need in your contract. Also, be sure to download the Photography Contract Template so that you can customize for your own use. It's a great starting point, and includes written clauses that have saved my rear end many a times, and even has helped me in court. My disclaimer is that I am not a lawyer or legal professional of any kind. While extremely useful, the Contract Template I provide to you should not be taken for legal advice of any kind. Use it as a starting point for your own business. I also highly recommend you consult with your own lawyer or professional counsel for personalized advice. On that note, let me preface these recommendations by stating that expensive gear does not “make” a photographer, so don’t fall into that trap. It’s your understanding of the basics of photography like lighting, composition, etc. If you don’t own all of the items on this list, don’t freak out. I started off with very entry level gear years ago, and while I’ve done some upgrading, I still don’t own all of the items on this list. This list will give you a feel for the options available to you, which are plenty. In this lesson, we discuss the importance of taking care of those numerous last minute details the day (or two) before the shoot. Be sure to download the Preparation Checklist (Microsoft Word Document) for your own use and customization. In this lesson, we discuss a handful of ways to put your client at ease. The more comfortable they are during the shoot, the better their photos will turn out! In this lesson, we discuss some basic, easy-to-remember posing techniques for you to use with your client during your photo shoot. In this lesson, we discuss some common mishaps that can happen during your photo shoot. If you want to read more extensively about some interesting predicaments I've personally found myself in, feel free to read my blog post at http://zenjoyable.com/photoshoot-mishaps-part-1/. They are true stories, folks. If this course has helped you thoroughly prepare for your upcoming photo shoot or has provided valuable, useful, and practical information to you, I ask that you leave a review for the course so that other potential students can know how awesome it is! My goal is to help as many people as possible successfully CRUSH their first paid photography session! I'm not going to go over the nuts and bolts of Lightroom, because that's an entirely separate course, and as I mentioned previously, I want to focus on the PREPARATION and BUSINESS aspect of photography. There are many Lightroom Courses out there. However, I do want to impress upon you the importance of having a streamlined workflow that makes post-processing as easy as possible on you, and the general consensus is that Adobe LightRoom does just that. In this lesson we chat about how the way in which you present your photos to your client is everything. Take care and put thought into your online and offline presentation. In this lesson, we chat how to easily collect client testimonials, as well as how to get referrals. Both of these things are extremely important to get continual business. Collecting Client Testimonials and Referrals: The Lifeblood of Your Business! In this lesson, we discuss a couple tips on getting the credit you deserve when clients post your photography on social media sites. Listen to my interview with Frederick van Johnson: Photographer, Marketer, and Speaker. He’s been shooting professionally since 1989, and is also the host of a popular podcast. The art of marketing is near and dear to his heart, and he has helped build successful marketing campaigns for fortune 100 companies like Adobe, Apple, Yahoo!, and Aol. In the audio, I chat with Frederick about action being the best cure for those sleepless nights we spend worrying about our photography businesses, and how important it is to have your own email list. We also touch on the harm that competing on price can do to your business. I want to give a huge thank you to Frederick for taking the time to chat with us! I consider myself as much a student as the listening audience, and appreciate him sharing his extensive knowledge. 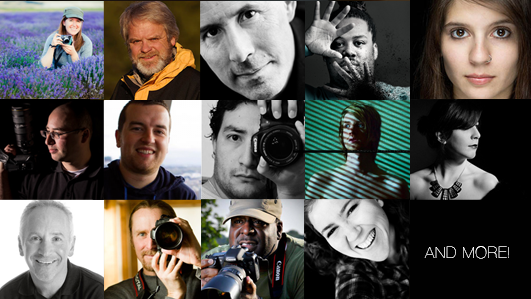 ...then head over to the Zenjoyable Pro Photographer Audio Interview Series. It's completely FREE to listen to, and we currently have 29 episodes (and counting). You can subscribe via iTunes, Stitcher Radio, or directly from Zenjoyable's interview page. Listen to Direct Interviews with the Pros. FREE. In this lesson, I talk about Zenfolio, which is a great resource for photographers looking to host, display, and sell their photos. I've been using them for years, have met the actual Zenfolio crew in person, and can highly recommend them.